As Ramadan is often a busy month of entertaining family and friends from sunset to sunrise, your home needs to reflect the special occasion of the Holy Month, as well as give an insight into your interior design taste and your hosting abilities! As we’ve got ideas on how to decorate your Dubai home for Ramadan 2018. Whether you’re hosting an iftar dinner or a suhoor soiree, we have plenty of ways you can decorate your dining table for the festive Ramadan period. From lanterns, to rose-gold cutlery and outdoor dining with colourful cushions, your home needs an ornate touch during the Holy Month –ready for you to entertain your guests. Of course, Ramadan is a religious time for giving back, reflection and fasting, as your home décor should also reflect the importance of the month and create a serene, comfortable setting for your loved ones to enjoy. For a lavish iftar, glam up for home with flashes of gold contrasted with blues or pinks, to create a showstopping table setting that your guests will admire. Use mirrors, reflective surfaces and lights to illuminate your gold hues and produce a special ambience. Lights accentuate the festive atmosphere and create a spiritual environment –perfect for reflection and an intimate iftar setting. Therefore, introduce as many decorative lanterns and tea lights as you wish, as the lantern is also often associated with the Holy Month. Get your best dinner set out, or invest in a new one, as Ramadan is a special occasion for you to enjoy and celebrate with your friends and family. From floral centre pieces on your dining table to intricate plates and napkins, get creative with different styles and experiment with contrasting designs. Create a Ramadan display with the moon and stars, candles and decorations which celebrate the Holy Month and welcome your family and friends into your home during this special time. The key to a successful host is planning and precision, from your iftar menu, to the food preparation and the layout of your table, it's imporant to get each aspect right. So, pick out a colour palette which suits your home and style, and start to decorate! Create an iftar dinner setting outside and enjoy Dubai's warm evenings surrounded by your loved ones. 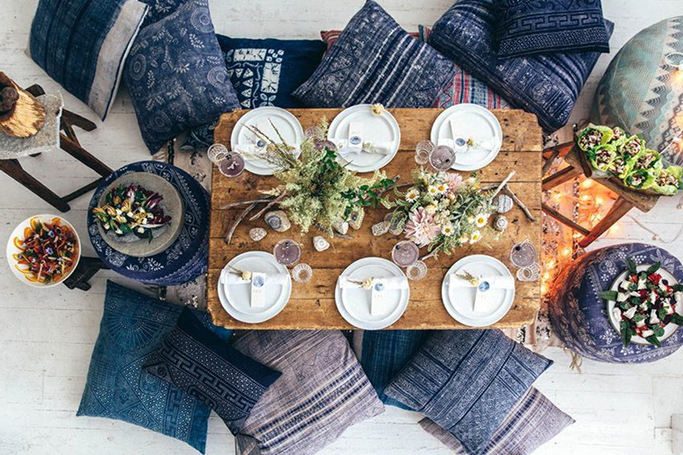 From colourful scatter cushions to pretty outdoor lighting and garden greenery, hosting an iftar outside can create a magical environment and the perfect setting for family and friends to gather in. From monochrome detailing to rose-gold cutlery and intricate table decorations, our next Ramadan decorating idea features style and simplicity, as your home should balance religion, tradition and still, design. Iftar shahy!